We're at the NPE: What's on Your Wish List? - KLA Industries, Inc.
We’re at the NPE: What’s on Your Wish List? 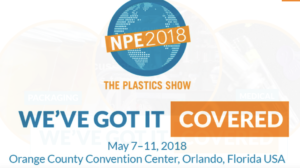 If you’re reading this on May 8-11, most of the KLA team is at our booth at the NPE2018 show in sunny Orlando! If you are at the show, please stop by our booth in the South Hall, S15088, say hi, and drop a business card for a chance to win a cool 3D printer. Our booth is very near the Biergarten (just a coincidence, ha ha). The Plastics Industry Association anticipates over 65,000 will be in attendance; personally I think they are being conservative and the actual number will be higher. If you are an HR professional or a hiring manager, let us know what’s on your wish list of industry talent. I’m sure not all 65,000 plastics professionals will stop by our booth, but it feels like most do. We will be talking to thousands of product designers, engineers, sales executives, polymer scientists, production managers, mold makers, and so on. If there is someone confidentially looking for a new position, and you might want to confidentially know about that person, who would they be? You can email me the answer to that question, at paul@klaindustries.com. If you are that person keeping their eyes and ears open for an opportunity potentially stronger than your current position, let us know that as well. We will be talking to most of the 2,000+ exhibitors over the course of the week, as well as hundreds of others just walking the show. They walk up to our booth and say things like “do you have any good molding engineers” or a hundred other roles. Let us know what types of roles you’re open to hearing about (again in strict confidence), and our answer might be “as a matter of fact, I might”. Whether you’re able to attend or not, it’s a great time for the Plastics industry and I hope your company is doing well thus far in 2018.